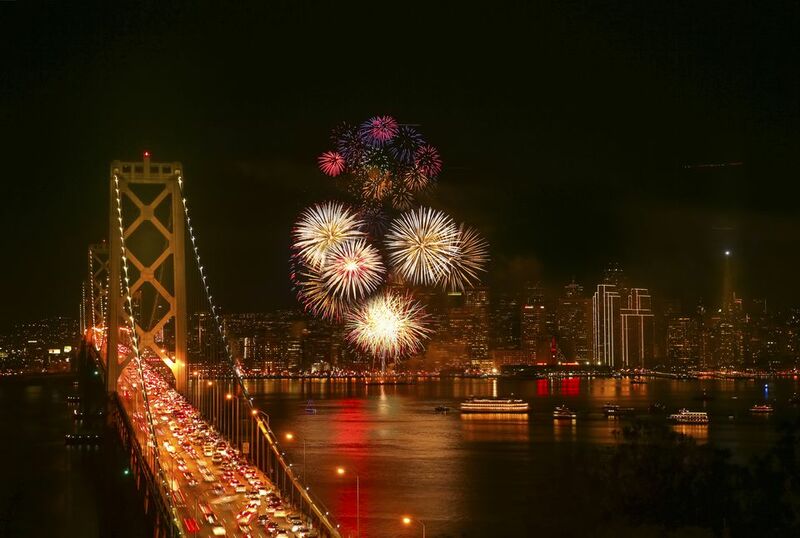 If you're looking to celebrate New Year's Eve in a big way, California's cities and towns have lots to offer. These are some ideas for the best ways to kick off the new year. This guide won't try to fill you in on every block party, street soiree, and popping champagne cork in all of Los Angeles. Instead, it focuses on just a few things that are so much fun that they might make you pack your bags and travel to LA just to enjoy them, especially when you know that WalletHub rates Los Angeles as one of the top cities in the country for New Year's Eve. One place you won't be ringing in the new year is at Universal Studios Hollywood. But the park is open normal hours on December 31, making it a good daytime destination for the last day of the year. Angelenos love to party, and you'll find big events everywhere. One that looks like a fantastic time is the Grand Park + The Music Center’s N.Y.E.L.A. It includes a light show and 3-D digital video mapping on the side of the City Hall building. At the coast in Marina Del Rey, they celebrate twice with East Coast and West Coast countdowns and fireworks at 8:59 p.m. and again at 11:59 p.m.
New Year's Eve in Long Beach: You can celebrate the new year in all kinds of ways in Long Beach, including a family-friendly celebration at the waterfront, harbor cruises and dance parties at the Queen Mary, Aquarium of the Pacific and downtown hotels. Rose Parade: The parade takes place on New Year's Day, but many people arrive on New Year's Eve afternoon to stake out a viewing spot along the street, as early as the local police will let them. The all-night party along the boulevard is hard to believe unless you see it. Host Your Own Private Party: Here's an idea you might not have considered, but it's a perfect fit if you like a little celebration but prefer not to get out in the middle of a big crowd. Find a vacation rental with great city views at Airbnb or HomeAway.com. After that, all you have to do is hang out on the deck with your favorite beverage and enjoy the fireworks going off all over town. Party hats are optional. New Year's Eve in the Orange County Theme Parks: Disneyland stays open late to bring in the New Year, but it's very crowded, sometimes so packed that they stop admitting guests by afternoon. All those people make a Ridemax itinerary not just a good idea but a necessity. Knotts Berry Farm celebrates New Year's Eve with fireworks, which are included in their regular admission price. New Year's on Catalina Island: The Casino Ballroom is an especially festive place to dance in the New Year, with "big band" music in a glamorous venue. San Diego: San Diego starts celebrating the new year early with the Holiday Bowl game and the Big Bay Balloon Parade which happens the same day. The big event in San Francisco is the New Year's Eve fireworks display, which goes off at the end of Market Street above the Ferry Building. Admission is free but you'll enjoy it more if you find the right place to watch it. San Francisco also includes some great things to do for non-dancers and non-drinkers. Sacramento: The state capital hosts two fireworks displays during their year-end Sky Spectacular: an early one accompanied by family-friendly tunes and a midnight show with rock music. Yosemite National Park: The Grand Majestic Hotel (formerly the Ahwahnee) throws a New Year's Eve party in their gorgeous dining room that includes a six-course meal and dancing. Lake Tahoe: At Tahoe, go to the south shore, you can celebrate the end of the year in style at one of the casinos. Lake Tahoe Cruises does New Year's Eve cruises and December 31 is also the last day of the Snowglobe Music Festival. When the new year begins, you'll be in perfect position to start it by skiing at one of the area resorts. All of that comes at a price: Lake Tahoe is among the most expensive places in California to ring in the new year.